Hand-picked Gregorian chant recorded live during Liturgical functions. With few exceptions (Tenebrae, lessons, etc. ), chant includes organ accompaniment. Sung by a male schola. Sung in the standard, traditional Solesmes style of chant. Chant Compendium 1 MP3 DOWNLOAD EDITION: Marian, Vespers and Benediction Hymns NEW! Chant Compendium 10: Corpus Christi Vespers, Friday Compline, Mass parts, and traditional hymns NEW! 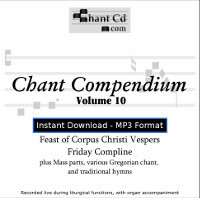 Chant Compendium 10 MP3 DOWNLOAD EDITION: Corpus Christi Vespers, Friday Compline, Mass parts, and traditional hymns NEW! Chant Compendium 2: Vespers, Benedictions Hymns and more! Chant Compendium 2 MP3 DOWNLOAD EDITION: Vespers, Benedictions Hymns and more! NEW! 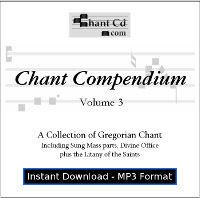 Chant Compendium 3 MP3 DOWNLOAD EDITION: Mass Parts, Kyriale and Divine Office NEW! Chant Compendium 4: Divine Office, Mass parts, and more! Chant Compendium 4 MP3 DOWNLOAD EDITION: Divine Office, Mass parts, and more! NEW! Chant Compendium 5: Divine Office, Benediction hymns, and more! Chant Compendium 5 MP3 DOWNLOAD EDITION: Divine Office, Benediction hymns, and more! NEW! Chant Compendium 7: Mass parts, Benediction hymns, and Divine Office NEW! 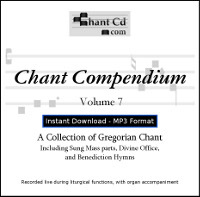 Chant Compendium 7 MP3 DOWNLOAD EDITION: Mass parts, Benediction hymns, and Divine Office NEW! Chant Compendium 8: Feast of the Sacred Heart of Jesus, plus other Gregorian chant NEW! Chant Compendium 8 MP3 DOWNLOAD EDITION: Feast of the Sacred Heart of Jesus, plus other Gregorian chant NEW! Chant Compendium 9: Solemn Requiem Mass, plus Lenten and Easter Gregorian chant NEW! Chant Compendium 9 MP3 DOWNLOAD EDITION: Solemn Requiem Mass, plus Lenten and Easter Gregorian chant NEW! Chant Compendium Vol 1-4 Box Set: Over 5 hours of Gregorian chant! Beautiful Gregorian chant to raise your mind and your heart to God!